Manages the County's computer-based mapping system which relates various types of data and information with real-world locations. A PDF version of the Ottawa County Plat Book is now available » Order a copy today! The basis of Ottawa County’s GIS is its library of GIS data layers. These layers provide a comprehensive representation of the County’s property fabric; basic infrastructure; environment; recreational facilities; governmental structure and facilities; emergency services infrastructure and facilities; and transportation network. These layers have been developed utilizing high-resolution aerial photos of Ottawa County as a base. These GIS data layers are developed and maintained by the GIS Department and other County Departments utilizing ESRI’s suite of ArcGIS software. The GIS Department manages an "enterprise GIS," allowing end users throughout many County Departments to access a central server database operated and maintained by the Department. 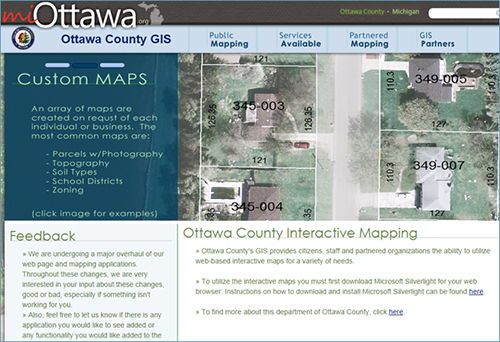 The Ottawa County GIS Department offers a variety of free and paid services and products which allow the general public, private sector clients, and governmental partners to view data, acquire hard-copy maps, or utilize data for their own projects. The GIS Department offers free access to its data through its interactive mapping services. The most accessed web application is Property Mapping, which allows users to view parcels by manually zooming or by searching for parcel number, parcel address, parcel owner, or proximity to another parcel. In addition to its free Web services, the Department also hosts an exclusive Web service for partners and offers a data downloading ftp service for the private sector. Most of the data layers in the Ottawa County GIS library are available for purchase for private use. Typically, the Department’s clients utilize the data for land engineering projects through ArcGIS or AutoCAD. However, other clients have utilized the Department’s GIS data in Photoshop or other photo programs for design projects. Pricing for data is set by the Ottawa County Board of Commissioners. Data requests can be made via e-mail at gisdept@miottawa.org, via phone at (616) 738-4600, or by visiting the GIS offices at the County’s Fillmore Street Complex at 12220 Fillmore Street, West Olive, MI 49460. For large data orders, the GIS Department hosts an ftp site which accommodates same-day delivery of data to its client. The GIS Department will also create customized data layers by request. This service includes labor costs. The GIS Department offers high-quality printed maps which can be customized to include data as requested. Maps can also be customized to size and scale as desired. The GIS Department printing plotting equipment allows the department to print maps at a maximum 42" width for a portrait size. Pricing for the printed maps are based on the layers included in the map and the map sizes. Standard map packages are available which allow customers to purchase maps at set size with a standard set of layers at a discounted rate. The rates for printed maps are set by the Ottawa County Board of Commissioners. The GIS Department has established collaborative data partnerships with 19 of the County’s 24 local units as well as the Ottawa County Road Commission and Ottawa County Central Dispatch. Under the partnership agreements, the GIS Department provides each partner with automated data updates, access to the GIS data library, access to exclusive Web mapping applications, and technical support. In addition, the GIS Department will also create customized data layers and applications by request to meet the needs of its partners. As an enterprise GIS, one key objective of the GIS Department is to seamlessly integrate GIS into the daily workflows of County Departments and partner organizations. In other counties and organizations, GIS integration has provided time and cost-savings, improved analysis capabilities, and enhanced decision-making capabilities. Therefore, in order to facilitate GIS integration, the GIS Department provides consulting services to its internal County agencies as well as its partner organizations. The GIS Department examines business practices for departments and develops recommended areas for applying GIS to daily tasks. Under certain circumstances, the GIS Department also will develop custom applications to meet the needs of County departments and partner organizations.